Simon & Schuster, 9780743243803, 224pp. From public radio This American Life contributor and self-described “history nerd” Sarah Vowell comes a collection of humorous and personal essays investigating American history, pop culture and Buffy the Vampire Slayer. In this insightful and funny collection of personal stories Vowell travels through the American past and in doing so ponders a number of curious questions: Why is she happiest when visiting the sites of bloody struggles like Salem or Gettysburg? Why do people always inappropriately compare themselves to Rosa Parks? Why is a bad life in sunny California so much worse than a bad life anywhere else? What is it about the Zen of foul shots? And, in the title piece, why must doubt and internal arguments haunt the sleepless nights of the true patriot? Her essays confront a wide range of subjects, themes, icons, and historical moments: Ike, Teddy Roosevelt, and Bill Clinton; Canadian Mounties and German filmmakers; Tom Cruise and Buffy the Vampire Slayer; twins and nerds; the Gettysburg Address, the State of the Union, and George W. Bush's inauguration. The result is a teeming and engrossing book, capturing Vowell's memorable wit and her keen social commentary. Sarah Vowell is a contributing editor for public radio's This American Life and has written for Time, Esquire, GQ, Spin, Salon, McSweeneys, The Village Voice, and the Los Angeles Times. She is the author of Radio On, Take the Cannoli, and The Partly Cloudy Patriot. She lives in New York City. 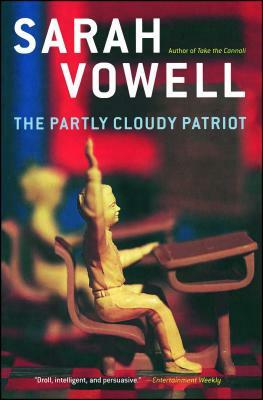 Hartford Courant [Vowell's] collection of essays explores patriotism and other aspects of contemporary life from the refreshingly contrarian view of a thoughtfully disaffected, wryly outspoken and deeply passionate citizen. San Francisco Chronicle Even though her pieces make us laugh about every fourth line, we feel as if there's something more significant at work....A writer of fierce observational powers who wears her intelligence and wit as comfortably as an old pair of pajamas. Entertainment Weekly Droll, intelligent, and persuasive.